Don Buckley lost his job driving a Chicago Transit Authority bus almost two years ago and has been looking for work ever since, even as other municipal bus drivers around the country are being laid off. Mr. Buckley is one of tens of thousands of once solidly middle-class African-American government workers — bus drivers in Chicago, police officers and firefighters in Cleveland, nurses and doctors in Florida — who have been laid off since the recession ended in June 2009. Such job losses have blunted gains made in employment and wealth during the previous decade and undermined the stability of neighborhoods where there are now fewer black professionals who own homes or who get up every morning to go to work. Though the precise number of African-Americans who have lost public-sector jobs nationally since 2009 is unclear, observers say the current situation in Chicago is typical. There, nearly two-thirds of 212 city employees facing layoffs are black, according to the American Federation of State, County and Municipal Employees Union. The central role played by government employment in black communities is hard to overstate. African-Americans in the public sector earn 25 percent more than other black workers, and the jobs have long been regarded as respectable, stable work for college graduates, allowing many to buy homes, send children to private colleges and achieve other markers of middle-class life that were otherwise closed to them. Blacks have relied on government jobs in large numbers since at least Reconstruction, when the United States Postal Service hired freed slaves. The relationship continued through a century during which racial discrimination barred blacks from many private-sector jobs, and carried over into the 1960s when government was vastly expanded to provide more services, like bus lines to new suburbs, additional public hospitals and schools, and more. But during the past year, while the private sector has added 1.6 million jobs, state and local governments have shed at least 142,000 positions, according to the Labor Department. Those losses are in addition to 200,000 public-sector jobs lost in 2010 and more than 500,000 since the start of the recession. The layoffs are only the latest piece of bad news for the nation’s struggling black middle class. A study by the Brookings Institution in 2007 found that fewer than one-third of blacks born to middle-class parents went on to earn incomes greater than their parents, compared with more than two-thirds of whites from the same income bracket. The foreclosure crisis also wiped out a large part of a generation of black homeowners. The layoffs are not expected to end any time soon. The United States Postal Service, where about 25 percent of employees are black, is considering eliminating 220,000 positions in order to stay solvent, and areas with large black populations — from urban Detroit to rural Jefferson County, Miss. — are struggling with budget problems that could also lead to mass layoffs. The postal cuts alone — which would amount to more than one-third of the work force — would be a blow both economically and psychologically, employees say. 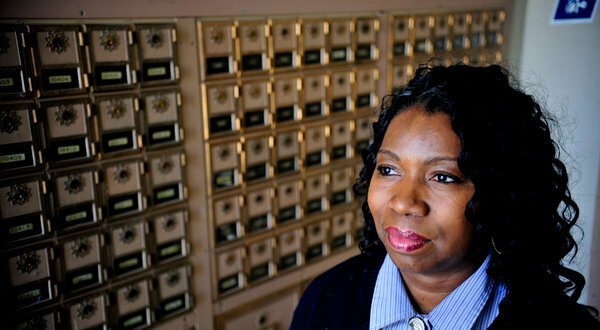 Pamela Sparks, 49, a 25-year Postal Service veteran in Baltimore, has a brother who is a letter carrier and a sister who is a sales associate at the Postal Service. Her father is a retired station manager. In Michigan, Valerie Kindle, 61, who was laid off in April as a state government employee, said the loss of her $50,000-a-year job with benefits had caused her to put off retirement. Instead, she is looking for work. Two relatives have also lost state government jobs recently. “She’s ready for me to get up out of here,” he said. In the meantime, Mr. Buckley says his life has drifted into the tedium of looking for decent-paying jobs that do not exist. Copyright 2011 The New York Times Company. Reprinted from The New York Times, National, of Tuesday, November 29, 2011.